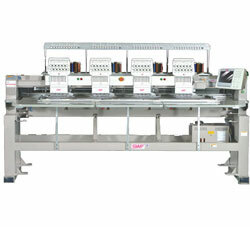 The SWF / K-UK1504-45 Automatic Embroidery Machine includes an LCD monitor as a standard feature. This full-color LCD control panel is easy to operate, plus you will be able to track the design as it sews and view the number of stitches per design on screen. The SWF / K-UK1504-45 is also equipped with a floppy disk drive and a USB port to connect a USB storage device.